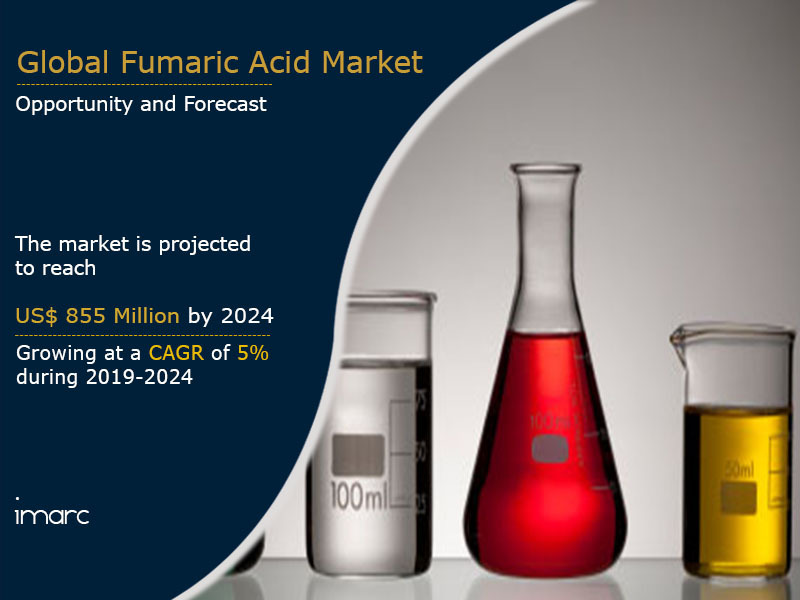 The global fumaric acid market was worth US$ 631 Million in 2018. Fumaric acid is a white or colorless crystalline chemical compound with a fruit-like taste. Also known as trans-butenedioic acid, it is naturally found in eukaryotes, bolete mushrooms, lichens and Iceland moss. It is also produced by humans when the skin is exposed to sunlight. Similar to malic acid, fumaric acid helps in the production of energy from food in the form of ATP. It is the strongest organic food acid as it a has higher relative sourness than other acidulants. Therefore, it offers long-lasting sourness and flavor as well as decreases the pH with minimal added sourness when used as a food additive. Commercially available in the form of dry powder, liquid or large pellet crystals, fumaric acid is also used in the manufacturing of medicines, animal feed, unsaturated polyester, cleaning agents and printing inks. Fumaric acid is used as an acidulant, pH controller and flavor enhancer in the food and beverage industry. The rising popularity of processed foods, along with the increasing use of flavoring agents, is augmenting the demand for fumaric acid globally. Additionally, the presence of carbon-carbon double bonds and two carboxylic groups makes fumaric acid chemically suitable for polymerization and esterification reaction. As a result, it is widely employed in the production of alkyd and polyester resins which are durable, have a hard structure and offer high resistance to chemical corrosion. Besides this, it is also used for manufacturing body panels for both light- and heavy-duty vehicles. Looking forward, the market value is projected to reach US$ 855 Million by 2024, exhibiting a CAGR of around 5% during 2019-2024. Based on the application, the market has been segmented into food additives, rosin-sized sheathing paper, unsaturated polyester resins, alkyd resins and others. Food additives currently represent the biggest application segment. Based on the end-use industry, the market has been segmented into food and beverages, cosmetics, pharmaceuticals and chemicals. On a geographical front, the market has been categorized into Asia Pacific, North America, Europe, Middle East and Africa, and Latin America. Amongst these, Asia Pacific is the biggest market for fumaric acid, accounting for the majority of the global share. The competitive landscape of the market has also been examined with some of the key players being Bartek Ingredients Inc., Dastech International, Fuso Chemical Co., Ltd., Polynt, Prinova Group, Changzhou Yabang Chemical Co. Ltd., Nippon Shokubai, The Chemical Company, Thirumalai Chemicals, U.S. Chemicals, Wego Chemical Group and Huntsman Corporation. How has the global fumaric acid market performed so far and how will it perform in the coming years? What are the key regional markets in the global fumaric acid industry? What is the breakup of the global fumaric acid market on the basis of application? What is the breakup of the global fumaric acid market on the basis of end-use industry? What are the various stages in the value chain of the global fumaric acid market? What are the key driving factors and challenges in the global fumaric acid market? What is the structure of the global fumaric acid market and who are the key players? What is the degree of competition in the global fumaric acid market? How is fumaric acid manufactured? 14.3.3 Fuso Chemical Co., Ltd.
14.3.6 Changzhou Yabang Chemical Co. Ltd.